Volunteering with Revolutions is another great benefit of membership within our Cooperative. We are a community bicycle program led and inspired by volunteer efforts, and the shop is only as strong and vibrant as our volunteer workforce. Disassemble a bicycle: Not all bicycles that are donated to Revolutions can be used. Many of the bicycles donated to the shop are used to teach our volunteers how to properly remove all the parts and components commonly found on bicycles. The parts from such bicycles are often used to stock our inventory of reusable parts while the frames are recycled through local scrap yards. 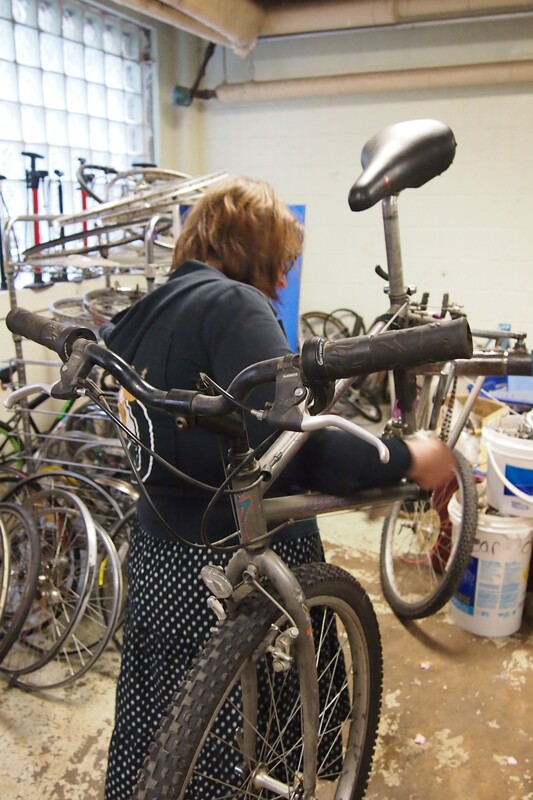 Repair a bicycle: Volunteers will complete partial repairs to bicycles that are being used in the various community programs that Revolutions is engaged in year-round. This might include fixing children’s bikes for participants in one of our bike safety clinics or repairing bikes that will be use to tour out of town guests around Memphis. Volunteers will learn some basic mechanical skills during this work, but will not gain a total understanding of all the facets of bike repair, in one work session. Shop Maintenance: Volunteers can expect to sometimes be asked to participate in special construction projects, cleaning the shop, sorting and integrating parts into inventory, doing light carpentry work or painting. Volunteers keep the program organized and running smoothly – without their assistance we’d be in a big, unorganized mess! If you’d like to contribute as a volunteer in some other way, please let us know! We’d love to have you! There are a variety of other tasks for volunteers to perform at Revolutions, so if you have any questions about volunteering, feel free to email us.